While I'm Waiting...: CAUSEBOX summer box reveal! 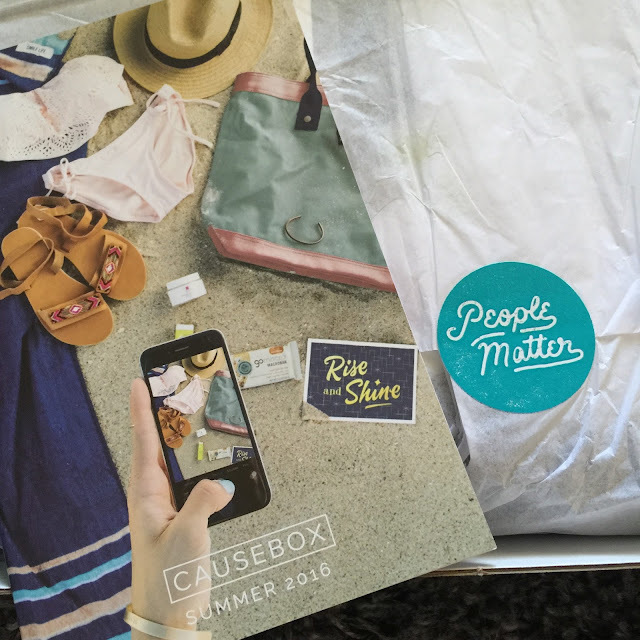 CAUSEBOX, a quarterly subscription box filled with beautiful products from companies with hearts to save the world. The products inside each CAUSEBOX help provide jobs, meals, education, clean water and more to countless women, men, and children around the world. On a number of occasions, I've shared with you my love for CAUSEBOX. 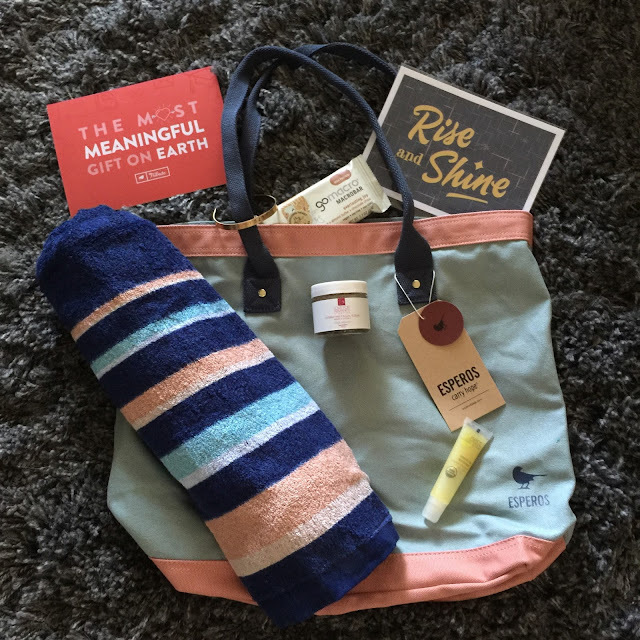 It combines my love of subscription boxes as well as shopping with a purpose! I love the surprise of not knowing what will arrive each season but enjoy knowing I will absolutely love everything that is in the box. Not only that, I will learn about new companies and causes and that makes this subscription box my FAVORITE!!! I came home from a recent road trip to find this lovely box waiting for me! I didn't even unload my car before I opened this box! I just couldn't wait!!! #peoplematter Yes, yes they do!!! Here is a little background on all the goodies that were packed in the summer 2016 box! 1. Tribute - "Tribute started in the summer of 2013 as a simple gift from Miki to Andrew. Miki sent an email out to 20 of Andrew's closet friends and family members and asked them to send in a video telling Andrew why they loved him and/or how he's impacted their lives. The result was a 20 minute video montage that was the most meaningful gift Andrew had ever received. After hearing how difficult it was for Miki to create the Tribute, Andrew had his "lightbulb moment." What started as a simple gift, grew into a business and movement to help the masses experience the same joy that Andrew felt that first night." Included in each CAUSEBOX was a voucher for a free video Tribute! 2. Branded Collective - "Many victims of human trafficking are BRANDED; their captors physically mark them with a number or symbol. The process is often violent: a forced tattoo, a burn or knife cut. When you receive your item from the BRANDED Collective, you are BRANDED. Each piece contains a unique number that represents one of the millions trapped in the nightmare of trafficking. The BRANDED Collective employs survivors of human trafficking from Nashville-based non-profit End Slavery Tennessee. The women work with local artisans to design and handcraft the jewelry collection. 25% of the profits go to the rescue and restoration of survivors." Each summer CAUSEBOX includes a brass mini cuff. This was definitely a FAVORITE of mine! 3. GoMacro - GoMacro is based on five core company principles: each tasty bar is vegan, macrobiotic, wholesome, sourced sustainably, and my favorite, they give back! This brand new bar believes in paying it forward, giving back, and changing the world! Their hope is that the more people they can give to, the more people who in return will give to others. 5. The Smile Life - Founder, Kyle Lawrence, was working in hotel management in Newport Beach, California. He served many powerful and famous people but he was surprised to see that many of these people never smiled. He thought that some seemed miserable and began to reconsider what it meant to be successful. He eventually left this job and started The Smile Life with the goal of "encouraging and enabling more people to smile!" "Every product that The Smile Life sells, they donate an oral hygiene kit to an at-risk youth organization. Additionally, The Smile Life provides mentorship, accountability, and guidance to at-risk youth in Los Angeles." Included in each CAUSEBOX was an exclusive towel from The Smile Life! 6. Love for Humanity - "Their products are USDA Certified Organic and completely free of chemicals, toxins, and fillers of any kind. Their products work (and smell) amazing, and they donate a meal for every product sold!" "By donating one meal for every product sold (through their charity partner Feed the Children), Love for Humanity Organics has been able to donate more than 25,000 meals so far - and their goal is to donate 5 million meals to children worldwide." Each summer CAUSEBOX included a hydrating facial scrub with argan and coconut. I'm anxious to try this out! 7. Juice Beauty - "Through and through, Juice Beauty is rethinking and improving the way beauty and skincare products are made - and when 60% of what is placed on skin is absorbed - we're grateful that they're leading the charge in giving us natural, ethical, and sustainable options!" Included in this season's box was a tube of organic lip moisturizer. 8. ESPEROS - "ESPEROS donates 10% of each sale to the Nobelity Project, a non-profit committed to ensuring education for all." "Every product sold helps fund one year of eduction for childrn in the developing world - to date, ESPEROS has funded the construction of school buildings, provided textbooks, paid tuitions, and funded mobile libraries across Guatemala, Honduras, and Kenya." Each summer CAUSEBOX included a summer tote (and it is fabulous!). I love how the towel and the tote coordinate. This tote was, indeed, my FAVORITE and I've already browsed their website and the rest of their line is fabulous as well! And, there you have it! 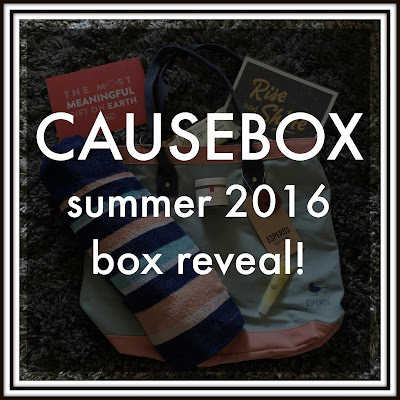 The 2016 summer CAUSEBOX! If you enjoy subscription boxes and purchasing with a purpose - then you definitely need to check them out! I can promise they'll become your new FAVORITE too! It is cute! And a little something different from the norm! Love it! That is so cool. I love the idea behind each thing. Very cool. Thanks, Patrick! Me too! I love learning about companies that aren't just about making more money! Companies that give back are my favorite!